Do you care about where you live and work? Have you through about becoming a local Borough or Parish Councillor? 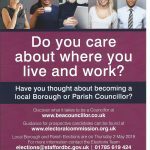 Local Borough and Parish Elections are on Thursday 2 May 2019.